I am trying to create an order on my WooCommerce store from my mobile application using the REST API v2. The order is created successfully but I can't find any solution to the following issues. 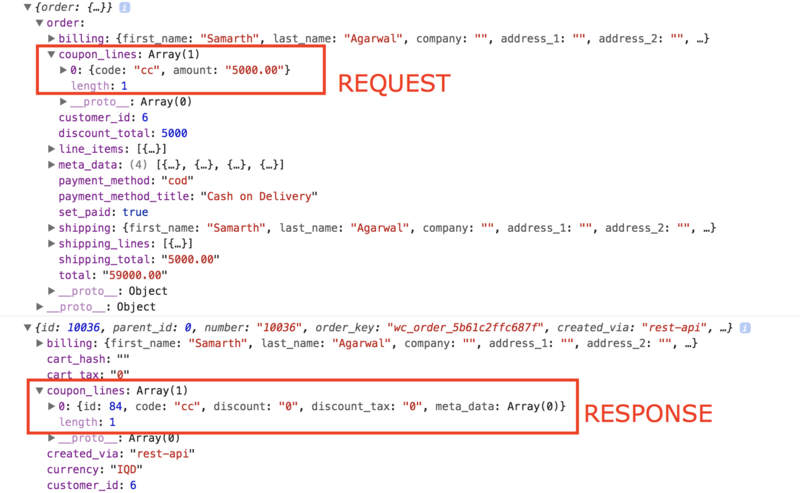 I send a coupon_lines array within the order object and when the order is viewed on the admin panel, it shows the coupon there but the order total is not affected at all. Then I decided to calculate the total and discounts based on the applied coupon manually. I tried to set discount_total within the order object equal to the amount which is the value of the coupon. I also update the total manually as well. But again, all the values that I pass are ignored and the order total is equal to the sum of the prices of all line items (ignoring discount_total). Here is a sample JSON object that is sent to the API from my app. What other options do I have to set an order total and discount manually? Any suggestions are welcome. If you're already doing this - consider posting an example request here. Not the answer you're looking for? Browse other questions tagged woocommerce rest-api wp-api or ask your own question.